"Wite-Out," sometimes spelled "White Out," was created in 1966 by George Kloosterhouse and Edwin Johanknecht. It was the first correction fluid for photostatic copying paper. In 1992, Wite-Out Products, Inc. was acquired by the BIC Corporation. While Wite-Out remains an effective method for correcting printed errors, it can be messy and leave stains. Wite-Out that gets onto a floor can dry and bond to the surface. Removal requires scraping it off and applying a dissolving product. Removing Wite-Out from floors requires a dissolving product. Use a putty knife to gently scrape the dried Wite-Out off the floor. The edge of a credit card also may work to prevent scratching a wood-finish floor. Apply Motsenbocker's Lift Off #2, Oops! Multi-Purpose Remover or WD-40. These products work to dissolve any remaining Wite-Out on the floor. Choose one of the products and spray it on the Wite-Out . Let it sit for a minute. 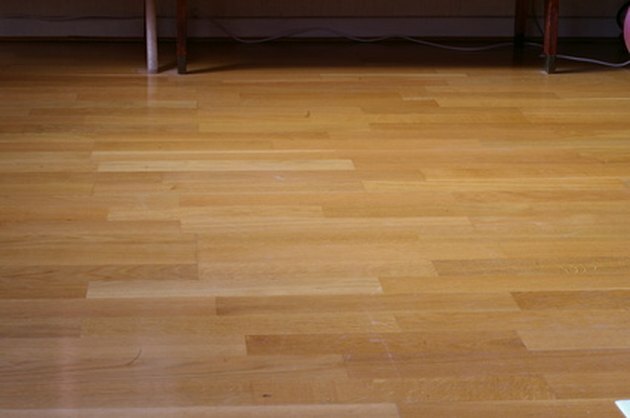 Wipe small sections of the floor in a circular motion. Use a clean cloth or paper towel. Apply additional product as needed to dissolve and remove any remaining Wite-Out. Scrape any remaining thick spots with the putty knife or a credit card.